Ukrainian developer 4A Studios draws direct inspiration from the Chernobyl nuclear disaster to create its grim post-apocalyptic horror action-adventure series, Metro. Yug saw the upcoming instalment, Last Light, and spoke with 4A's Huw Beynon. Rivulets of rain water trickle down the crumbling stairs. Laboriously continuing upwards to the sound of our own heavy breathing within a gas mask, a glitter begins to creep across the path, light refracting around a dense layer of irradiated particles hanging in the air. Soon it becomes more pronounced, glinting off the beads of moisture clinging to the inside of our mask until the brightness is so intense it’s momentarily blinding. Our eyes finally adjust to reveal an apocalyptic scene: what was once a sprawling metropolis is now an empty husk of deteriorated buildings, eroding towers thrusting skyward through rubble and debris. Menacing clouds hang low in the sky, split by sudden flashes of forked lightning, and always the miserable patter of acid rain. The remnants of a passenger jet litter the immediate area. Only the tail end of the fuselage appears to be intact, though it’s scorched and damaged beyond repair. Exposed wires hang limply from the shredded outer shell like an eviscerated torso. A luminescent number ticks down on the wristwatch. 0430. 0429. 0428. Less than four and a half minutes worth of filtered air. Welcome to Moscow in the year 2034. 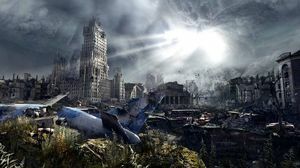 The post-apocalyptic future vision of Russia is the result of nuclear war, forcing all who survived to seek shelter in the underground metro tunnels, a scenario established in the first Metro 2033 game. Mutant creatures own the ruined surface and stalk the passageways below, while the survivors struggle in a bitter civil war. 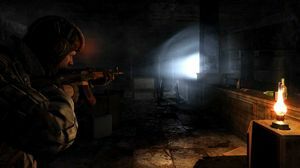 More than just a shooter, Metro Last Light is an action-adventure that mixes combat, survival horror, exploration, and even light RPG elements. Limited resources force a more considered approach, as every bit of shelter, light, air, and ammunition is a precious commodity that must be scavenged, fought for, and guarded. The short level shown from early in the game demonstrates this in action. Crossing an extremely hostile section of Moscow’s ruined surface to reach one of the new station cities, the layers of detail come together to create an immaculately unsettling tone. At one point a flashback sequence is triggered while inspecting the decayed bodies of the doomed passengers aboard the aforementioned plane, giving a cockpit view of the final free-fall while nuclear warheads explode in the foreground and screams of terror come from behind. It’s a harrowing hallucination. In the Moscow metro, ghosts and demons do exist, and inexplicable phenomena abound,from demonic winged beasts to wild dog-like creatures. Combat doesn’t appear to deviate from first-person shooter standards. The guns are a point of difference, for although the setting is futuristic the arsenal is decidedly retro: shotguns and bolt-action rifles. 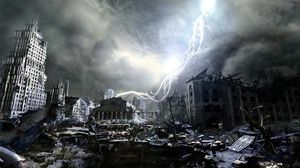 Metro Last Light will be available for PlayStation 3, Xbox 360, Wii U and PC early 2013.